Paul Crutzen won the Nobel prize in Chemistry in 1995 for his work on the chemical compounds that were causing the hole in the ozone layer. In 2000 Paul Crutzen, the Dutch atmospheric chemist and Nobel prize-winner, and American ecologist Eugene F Stoermer, proposed using the term ‘anthropocene’ for the current geological epoch to emphasize the central role of mankind in geology and ecology. Fifteen years on, several of the papers that were presented at the four-day World Economic Forum in Davos, Switzerland, last week referred to the advent of the Anthropocene era, though it is doubtful if many of the 2,500 attendees paid much attention. So what is a geological epoch, when did the Anthropocene epoch start, and how is the Anthropocene relevant to us? You will know about the Jurassic period when dinosaurs roamed the earth*. But do you know some of the other periods of geological time: the Cambrian, the Devonian, the Carboniferous, the Triassic, the Cretaceous? The Cambrian period started about 540 million years ago, and the Cretaceous period ended 66 million years ago. This enormous length of time is only 10% of the age of the Earth, which is 4.6 million years old. The last 66 million years is also made up of geologic periods: the Paleogene, the Neogene and the Quaternary, and to make it more complicated, the Quaternary period is made up of two epochs, the Pleistocene (2.6 million years ago to 11,700 years ago) and the Holocene (11,700 years ago to the present day). Even though human beings first appeared between 400,000 and 250,000 years ago, the Holocene, the start of which is marked by the end of the last major ice age, encompasses the rise of modern humans, all human written history, the development of major civilizations, and the relatively recent transition toward urban living. The word Holocene means ‘entirely recent’ and comes from the Greek holos, meaning ‘whole’ or ‘entire’, and –cene meaning ‘new’. 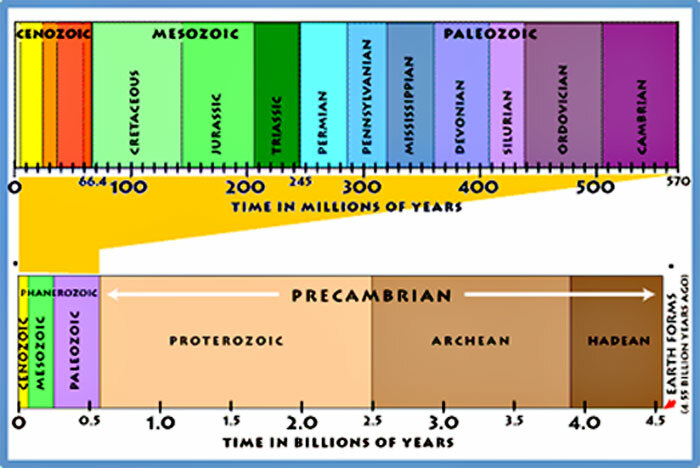 In this geological time chart, the time before the Cambrian period, the Pre-Cambrian, which extends for most of the top level, covers seven-eighths of the age of the earth, with the remaining one-eighth expanded into levels below. But for some time, geologists, climate scientists and ecologists have been debating whether the profound effect that the human species is having on the Earth means that we are moving from the Holocene to a new epoch, the Anthropocene (pronounced an-thropo-scene). The first use of a similar term however goes back to 1873 when the Italian geologist Antonio Stoppani acknowledged the increasing power and effect of humanity on the Earth’s systems and referred to an ‘anthropozoic era’. Incidentally Eugene Stoermer originally coined the term in the 1980s, but never formalised it until Paul Crutzen, who had started using the term, contacted him. 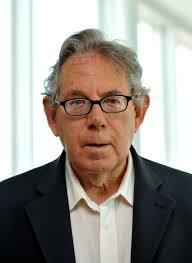 The name Anthropocene is a combination of the Greek roots anthropo- meaning ‘human’ and -cene meaning ‘new’. Geologic epochs primarily refers to geologic time based on boundaries between different rock strata differentiated by fossils, which is the science of stratigraphy, and any decision on recognising the Anthropocene epoch, which is still an informal term, lies with the International Commission on Stratigraphy (ISC). The ISC set up an international Anthropocene Working Group of scientists which was ‘tasked with developing a proposal for the formal ratification of the Anthropocene as an official unit amending the Geological Time Scale’. The working group, which first met in Berlin last year, has given itself until 2016 to come up with the proposal to submit to the ISC, but this month they put forward their initial view. The working group has proposed that if there were to be a single date to mark its beginning of the Anthropocene epoch, it would be 16 July 1945, the date that the first atomic-bomb test took place at the US Army testing range at Alamogordo in New Mexico, as the subsequent nuclear tests left an indelible mark around the Earth due to the release of radioactive isotopes or ‘fallout’ which settled in the soil and land around the world. This event also coincided with a worldwide ‘great acceleration’ of other human activities that ushered in a new geological epoch. However a significant minority of the working group supported alternative dates, and the group plans to bring forward a formal, evidence based, proposal in 2016. Scientists have argued for a number of different dates that mark the start of this new human epoch. One date is the start of the industrial revolution in England in the 18th century when coal became the main source of fuel, production by hand changed to production by machine, new processes to produce iron were introduced, and the use of steam power increased dramatically. Earlier dates include the invention of agriculture and the clearing of forests about 10,000 years ago, and even further back to 14,000 to 15,000 years ago based on lithospheric evidence, the exposed top layers of the earth. These latter dates would be closely synchronous with the current epoch, the Holocene. 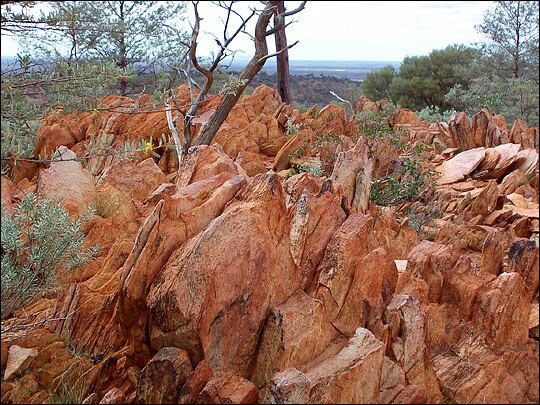 These are the sandstone rocks in Jack Hills in Western Australia, in which zircon crystals found by geochemists Bruce Watson and Mark Harrison in 2005, were later dated as being 4.4 billion years old, the oldest material so far found on Earth. There was a news item on the BBC website a few days ago that tiny crystals of zircon, a blue semi-precious stone, that had been found in a much younger sandstone in the Jack Hills in the Murchison river basin in Western Australia, were the oldest fragments of the earth’s crust. The age of the crystal, which was dated using the decay of trace uranium atoms within it, is 4.4 billion years, only 200 million years after the formation of the earth itself. This is in the very earliest part of the Pre-Cambrian era that makes up seven-eighths of geologic time. The significance of this discovery is not so much how old the rock was, but that it is evidence of the earth having had a solid crust much earlier than had been thought and consequently of having been able to host life very early in its history. As for the oldest rocks in the world, that is rocks consisting of minerals that have not been subsequently melted or broken down by erosion – unlike the Jack Hills zircon – there are four contenders, depending on the latest research. The rocks are all gneisses (gneiss is pronounced ‘nice’), rocks formed, or metamorphosed, by the action of heat and pressure on earlier rocks. Gneisses are hard, folded, and characterised by darker and lighter coloured bands, and they are widely distributed around the world. The four locations are in south-western Greenland; the Jack Hills area of Western Australia as above; and in two locations in Canada, the eastern shore of the Hudson Bay and the Canadian shield in the Northwest territory. These rocks have all been dated as being between 3.8 and 4.4 billion years old. The difficulty in assigning the title of oldest to one particular formation of gneiss is that they are all extremely deformed, hence claiming one site to have the oldest rocks may be as much a matter of luck in sampling as by an understanding of the rocks themselves. In this geologic time chart, the Pre-Cambrian period, because it covers seven-eighths of the age of the earth occupies most of the lower scale, with the remaining one-eighth expanded into the upper scale. For comparison purposes the Jack Hills zircon were formed in the dark-brown Hadean period at the very beginning of the Pre-cambrian era, and the chalk cliffs of Dover were formed in the light green Cretaceous peiod above, only about 100 million years ago. Incidentally this is an American chart, and in the UK the two blue periods between the Permian period and the Devonian, are called the Carboniferous period, which is when coal was formed. But where are the oldest rocks in Britain? The oldest rocks, the Lewisian gneiss of the Pre-Cambrian era, date from at least 2.7 billion years old – close to two-thirds of the age of the planet – and can be found at the surface in the far north-west of mainland Scotland and on the Hebridean islands. This rock is thought to underlie much of the Britain Isles although boreholes have only penetrated the first few kilometres. The main outcrops of Lewisian gneiss are on the islands of the Outer Hebrides, including Lewis, from which the formation takes its name, but the oldest of these rocks, are on the mainland around Scourie and Laxford Bridge, small villages halfway between Ullapool and Durness.